Avoid those annoying email notices and fines by returning your library books and DVDs before leaving town for winter break. You can view your checked out items and their due dates by logging-in to your library account. 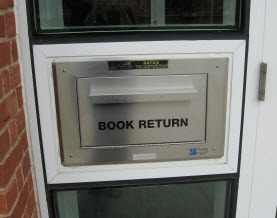 Return your library items at any time using the 24-hour return box located at the main entrance of the library. Contact Library Services at 781.891.2168 or libraryservices@bentley.edu if you have questions about your checked-out items or need renewal assistance. View the library’s winter break hours at http://library.bentley.edu/about/hours.asp. Don’t Be Late! Return or Renew Library Items Before Winter Break. Avoid annoying overdue notices and fines by returning your library books and DVDs before leaving town for winter break. Now’s the time to log-in to your library account to see what you currently have checked out. Return your library items at any time using the 24-hour return box located at the main entrance of the library. Do you currently have library books or DVDs checked out? Don’t forget to return them before you leave for summer break. If you are going stay in the local area this summer and want to keep your books and DVDs, you may renew them online (items may be renewed once). Log-in to My Library Account to see what you currently have checked out and to request renewals. You may also contact the Library Services Desk at 781.891.2168 or libraryservices@bentley.edu for renewal assistance. We are sorry to report that access to all “My Library” accounts has been disrupted. Users are currently unable to login to their accounts to renew items or to place holds on books and DVDs. We are working to restore access, but do not know how long it will take. In the meantime, if you would like help with renewals or holds, please contact Library Services for assistance – call 781.891.2168, email libraryservices@bentley.edu or contact them using their chat widget.